What do I like to do? Well, it would probably be easier to tell you what I don't like to do! A quick glance at my lenses will show you that I have a lot of interests, from raising chickens to taking photos. 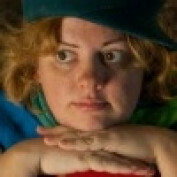 I'm a freelance writer, mixed media artist and children's portrait photographer. Want to see my work? My photography portfolio is at Katelyn Thomas Photography.